By 1863, General Robert Anderson’s health precluded a strenuous military command but he needed the compensation of an Army commission. 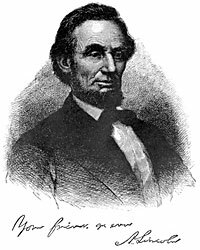 President Lincoln concluded an August 1863 letter to Anderson: “And now, my dear General allow me to assure you that we here are all your sincere friends.”1 As a Union Army major in early 1861, Anderson had commanded Fort Sumter in the harbor of Charleston until a Confederate bombardment forced him to surrender. Anderson’s steadfast attention to duty was not forgotten by Mr. Lincoln. The President had a careful memory – especially for those who had once given him aid. “Mr. Lincoln and Friends” remembers those friends. It is the second web site prepared by The Lincoln Institute under a grant from The Lehrman Institute. Through hyperlinks, it connects to “Mr. Lincoln’s White House,” the first site which the Institute’s staff researched and designed to provide the physical and personal backdrop to President Lincoln’s decisions during the Civil War. Mr. Lincoln’s Illinois friends came repeatedly to his aid – most dramatically when they engineered his nomination for President in 1860. Mr. Lincoln’s election, however, cast his friendships in a new light for both Mr. Lincoln and those who had supported him.. They were not only friends – but potential applicants for jobs for themselves and others. President Lincoln’s attention was always on the “work” so sometimes friendships suffered. He did not need to be surrounded by people who liked each other even though nothing gave him so much joy as conversation with an old friend. For Mr. Lincoln, it was more important to unify his party, restore the national Union, and secure freedom for all Americans. Several of the friends of Mr. Lincoln could well have been placed in more than one category – Pastor Owen Lovejoy might just as well have been listed in “Congress” where he served several terms. Journalist Noah Brooks might have been listed as one of the “Sons” with whom Mr. Lincoln had a virtual father-son relationship. Most of the friends who are profiled are men whose lives intersected with Mr. Lincoln in legal, political, public or military affairs. Relatively few are women are included since they were largely barred from these spheres. Nevertheless there is a section devoted to women who had a friendship lasting at least several years. For that reason, the emphasis is on Mr. Lincoln’s New Salem neighbor Elizabeth Abell rather than her sister Mary Owens with whom Mr. Lincoln had a somewhat romantic relationship of a much shorter duration. Many of Mr. Lincoln’s friends fell in several categories. Like Mr. Lincoln, Richard Oglesby was an attorney. Oglesby was a jack of all trades in his early life – working as a carpenter, gold miner, store keeper, soldier, and land speculator. He was speculative in financial affairs but more conservative in politics. He was widely traveled, widely read, well-spoken, well-connected, well-rounded in personality, experience and body. He was a good speaker with a good sense of humor. He enjoyed his liquor – but never got the reputation as an alcoholic which bedeviled his predecessor as governor, Richard Yates. He was self-taught and self-motivated like many of Mr. Lincoln’s friends. His ambitions for offices were thwarted until 1860, when he was elected to the Illinois State Senate. He had campaigned extensively with President Lincoln in 1858. Oglesby was close to the Bloomington group of Lincoln’s lawyer friends – David Davis and Leonard Swett. Like most Union generals, he showed a persistent interest in rank and promotion. Unlike Davis and Swett, Oglesby was a strong supporter of the Emancipation Proclamation, saying: “This proclamation is a great thing, perhaps the great thing that has occurred in this century. It is too big for us to realize.”6 Oglesby turned his war record into a political springboard – being elected to the governorship in 1864. He went to Washington twice in the next few months – last seeking to see Mr. Lincoln shortly before he was assassinated. Nevertheless, Oglesby is not one of those included in the site because the record of his interaction with Mr. Lincoln is limited. There is certainly room for argument about others who are included in this list of “Mr. Lincoln & Friends.” Horace Greeley, for example, caused Mr. Lincoln enough grief to have been dropped from most folks’ list of “friends.” But Mr. Lincoln persisted in treating him as a friend because it suited his political purposes to do so. Some men like Assistant Secretary of War Gustavus Fox or Thomas Eckert of the War Department’s Telegraph Office might have been included but they did not fit easily into one of the chosen ten categories. For descriptions of these and other men and women, consult Mr. Lincoln’s White House. Indeed, many persons covered in this site are also profiled on Mr. Lincoln’s White House – but with different material pertaining directly to their contact with Mr. Lincoln in Washington during the Civil War. A better understanding of these individuals relationship to Mr. Lincoln is obtained by reading the profiles on both sites. None of those profiled in Mr. Lincoln and Friends is black, although Mr. Lincoln had black friends in Springfield and Washington. The most prominent was abolitionist Frederick Douglass who was greeted as “my friend Douglass” when he entered the White House reception following the Second Inaugural. But Douglass, who is profiled on Mr. Lincoln’s White House, only met Mr. Lincoln on three occasions between 1863 and 1865 and he had been highly critical of Mr. Lincoln prior to those meetings. Those profiled on Mr. Lincoln and Friends generally knew Mr. Lincoln over several years or even decades and exchanged correspondence with him which revealed the character of their friendship. Other than Springfield barber William Fleurville, there is virtually no known correspondence with the Springfield blacks Mr. Lincoln knew. The rivalry among Mr. Lincoln’s friends was sometimes strong in life – such as the fighting over Owen Lovejoy’s congressional seat in 1858, the conflict over the Republican gubernatorial nomination in 1860 and the fight over the selection of a lawyer from Illinois to be appointed to the Supreme Court. The rivalry continued after his death – in politics and in biographers. At least seven close friends of Mr. Lincoln – Isaac Arnold, John G. Nicolay and John Hay, Ward Hill Lamon, William H. Herndon, Henry J. Raymond, and Henry C. Whitney – wrote biographies and sharply criticized each other’s accuracy and conclusions. Others wrote memoirs in which their relationship with Mr. Lincoln was prominently discussed. Their rivalry contributes to the richness of the record. Mr. Lincoln had to deal with the intense rivalry of some of these friends. The New York Tribune’s Horace Greeley called his former assistant, New York Times editor Henry Raymond, a “little viper.” Future War Department official Charles A. Dana quit Tribune in disgust because of disagreements with Greeley. New York newspaperman who didn’t get along – like Greeley and William Cullen Bryant – didn’t like Secretary of State William H. Seward and his political lieutenant, newspaper editor Thurlow Weed. Many of President Lincoln’s Cabinet members were barely on speaking terms with each other, much less with commanding generals. Even Mr. Lincoln’s Illinois political backers barely tolerated each other. What united them was their friendship to one unique American and the principles he espoused. Mr. Lincoln and Friends was originally created a project of The Lincoln Institute under a grant from The Lehrman Institute. The text was prepared by Richard J. Behn and the website was designed by Kathleen Packard of KathodeRay Media, Inc. This web site would not be possible without the scholarship of the legion of Lincoln scholars who have not only interpreted the lives Mr. Lincoln and his contemporaries, especially those who have compiled important primary sources so they are readily accessible for research. There are many important building blocks for any work such as this. The 10 volume compilation of The Collected Works of Abraham Lincoln edited by Roy P. Basler and others in the 1950s. More recently, the Library of Congress has compiled much of the incoming and outgoing correspondence in its Robert Todd Lincoln on the Library’s Web site (http://memory.loc.gov/ammem/alhtml/malhome.html). Rodney Davis and Douglas L. Wilson were the guiding editors on that project. They are also responsible for another invaluable resource which they edited – Herndon’s Informants, which collects the letters and interviews conducted by William Herndon and Jesse W. Weik in the process of preparing their own biography. Less extensive interviews were conducted by other biographers and have been collected in periodicals such as the Journal of the Abraham Lincoln Association. Historian Michael Burlingame has edited a series of books compiling work by presidential aides and confidantes Noah Brooks, John Hay, John G. Nicolay and William O. Stoddard which are invaluable sources for what happened at the White House during the Civil War. Other Administration figures and friends – such as Attorney General Edward Bates, Senator Orville H. Browning, Treasury Secretary Salmon P. Chase and Secretary of the Navy Gideon Welles – compiled diaries which long have been available in published form. Finally, there are hundreds of autobiographies, memoirs, biographies and collections of letters for persons who knew Mr. Lincoln which contained important nuggets of information and insights into relationships. This web site attempts to present as much evidence from primary sources without excessive editing and selective materials from secondary sources so that the interested reader can do further research. Original punctuation and spelling from primary sources is preserved although missing letters are sometimes added in brackets. Names of periodicals are uniformly italicized for the sake of clarity. 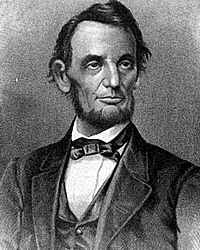 The Lincoln Institute has also helped support the compilation of the Presidential Papers of Abraham Lincoln Online. We gratefully acknowledge that most of the images on the site come from the Gilder-Lehrman Collection, the Library of Congress and the Illinois State Historic Library. Ida M. Tarbell, The Life of Abraham Lincoln, Volume I, p. 210. Letter to General John A. McClernand, January 22, 1863. Mark A. Plummer, Richard J. Oglesby, Lincoln’s Rail-Splitter, p. 85. Douglas L. Wilson and Rodney O. Davis, editor, Herndon’s Informants, p. 725-726 (Jesse W. Weik interview with Samuel H. Treat, 1883). Roy P. Basler, editor, The Collected Works of Abraham Lincoln, Volume IV, p. 160 (Letter to Alexander Stephens, December 22,1860). Douglas L. Wilson and Rodney O. Davis, editor, Herndon’s Informants, p. 713-714 (James K. Rardin to Jesse W. Weik, March 9, 1888). Richard E. Hart, “Springfield’s African Americans in the Lincoln Community”, Journal of the Abraham Lincoln Association, Volume 20, Number 1, Winter 1999, p. 47. Roy P. Basler, editor, The Collected Works of Abraham Lincoln, Volume VI, p. 386-387 (Letter to Robert Anderson, August 15, 1863). Francis Fisher Browne, The Every-day Life of Abraham Lincoln, p. 126. William Lee Miller, Lincoln’s Virtues, p. 24. Osborn H. Oldroyd, editor, The Lincoln Memorial: Album-Immortelles, p. 396. David Herbert Donald, “We Are Lincoln Men” Abraham Lincoln and His Friends, p. 3. David Herbert Donald, “We Are Lincoln Men” Abraham Lincoln and His Friends, p. 10. David Herbert Donald, “We Are Lincoln Men” Abraham Lincoln and His Friends, p. 28. David Herbert Donald, “We Are Lincoln Men” Abraham Lincoln and His Friends, p. xiv.